Tropical dry forests usually have more fertile soils than tropical rain forests. As a consequence, tropical dry forests are in a much more advanced state of destruction than rain forests. 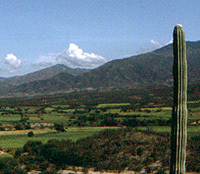 This view in the southern Tehuacán - Cuicatlán Valley of northern Oaxaca is typical: the entire valley floor that can be seen here has been destroyed and replaced by sugar cane and other crops.